Those who think that the referendum is used to validate a coup d’etat advice the Romanians to not participate, because the referendum is valid only if the majority of population goes to vote. No, really, don’t laugh, the power just wants to have a well organized voting process. UPDATE: During the local elections (june 10 2012) there were rumors about the fact that in many places the internet providers cut the internet access, from june 9 until the end of the elections, june 10. The rationale was to limit the spread of informations concerning Nicusor Dan, an independent candidate for Mayor of Bucharest. Now I can confirm you that now, Saturday june july 28, the romanian company ilink.ro practices internet censorship again, under the form of cutting internet access for (some of?) its clients. They don’t respond to calls, there is no reason announced for this cut. [on Sunday July 29 the internet access was better, as far as I could learn]. UPDATE (Aug 3): Total circus after the Government complaining to the Constitutional Court that the lists with Romanian citizens with the right of vote were inaccurate. Then the Constitutional Court decided to postpone its decision of validation of the referendum until September 12 (today they announced Aug 31 instead of Sept 12), asking the government for clarifications concerning the lists. The romanian prosecutors have already seized the lists and a criminal investigation started. The conclusion? Be it about the fact that the Ministry of Education does not assume the responsibility for giving (phD) titles to plagiators, or about the fact that universities don’t assume the responsibility for giving graduation or phD diplomas without a real basis, or finally about the fact that the Ministry of Internal Affairs now contradicts itself and cannot assume the correctness of the lists with citizens with the right to vote, it is clear that something very wrong now comes into the light. I think is an end of an era where here, in Romania, double talk and double standards, inherited from the supporters of the communist regime (still in charge in many domains), ARE FINALLY STARTING TO DIE. UPDATE (Aug. 21): Apparently, the referendum was declared invalid by the Constitutional Court, with 6-3 votes. See this, if you need: uniform structure and coarse structure. Given a set , endowed with an uniform structure or with a coarse structure, Instead of working with subsets of , I prefer to think about the trivial groupoid . Groupoids. Recall that a groupoid is a small category with all arrows invertible. We may define a groupoid in term of it’s collection of arrows, as follows: a set endowed with a partially defined operation , , and an inverse operation , , satisfying some well known properties (associativity, inverse, identity). – the set of objects is consists of all elements of with the form . – objects for all . In terms of groupoids, here is the definition of an uniform structure. Here is a definition for a coarse structure on a groupoid (adapted from the usual one, seen on the trivial groupoid). Look pretty much the same, right? But they are not, we shall see the difference when we take into consideration how we generate such structures. Question. Have you seen before such structures defined like this, on groupoids? It seems trivial to do so, but I cannot find this anywhere (maybe because I am ignorant). UPDATE (01.08.2012): Just found this interesting paper Coarse structures on groups, by Andrew Nicas and David Rosenthal, where they already did on groups something related to what I want to explain on groupoids. I shall be back on this. Among the persons subject to the complaint are: Traian Basescu (the suspended president of Romania), Emil Boc (ex Prime Minister), Monica Macovei (member of the European Parliament, ex Minister of Justice, credited with implementing justice reforms), Cristian Preda (member of the European Parliament), M.R. Ungureanu (ex Prime Minister, probably future candidate for President), Vasile Blaga (ex Speaker of the Senate), Sever Voinescu.Cezar Preda, Cristian Boureanu, Anca Boagiu, Raluca Turcan, Nicusor Paduraru, Ioan Oltean, Sebastian Lazaroiu, Andreea Paul. This comes after the release of a “much-anticipated report summing up five years of efforts by the ex communist state to reform its judiciary and fight corruption” see Barroso’ declarations. Le Monde: La Commission européenne met sous surveillance renforcée la Roumanie. In 2004 Rob Kirby publishes in the Notices of the AMS the opinion article “Fleeced?“. Let me quote a bit from it. “Most mathematicians feel that they own their journals. They write and submit papers to their favorite (often specialized) journals. They often referee for those same journals. And some devote time and energy as editors. Throughout this process there is no contact with nonmathematicians, except for some of the editors. It is no wonder that mathematicians have a sense of pride and ownership in their journals. A possibility is this: one could post one’s papers (including the final version) at the arXiv and other websites and refuse to give away the copyright. If almost all of us did this, then no one would have to subscribe to the journals, and yet they could still exist in electronic form. In 2012 appeared The cost of knowledge, a site inspired by the blog post Elsevier – my part in its downfall by Timothy Gowers. In 12 years the world changed a bit in this respect. It will change much more. Let me finish this post by describing my modest experience related to this subject, during these 12 years. In 2004 I was a kind of a post-doc/visitor (on a contract which was prolonged once a year, for a max of 6 years) at EPFL (Lausanne, Swiss). I already decided some years ago to act as if the future of mathematical publication is the arxiv and alike. One reason is the obvious fact that the www will change the world much more than the invention of the press did. Almost all research which was left in manuscript perished after the press revolution. Everybody who wants to give something to the research community has to put its research on the net, I thought, and simultaneously, to help the old system to die, by not publishing in paper journals. Moreover, I had troubles in the past with publishing multidisciplinary papers. I always believed that it is fun to mix in a paper several fields, that there is one mathematics, and so on, but such papers were extremely difficult to publish, at least these papers written by me, with my modest competence (and Romanian origin, I have to say this). So, lulled by the relative swiss security, I was just putting my papers on arxiv, moreover written in an open form which was inviting others to participate to the same research, at least that I was thinking. The result? In 2004-2005 I was practically laughed into the face. Who cares about a paper in arxiv, which is not published in journal form? In 2006 I returned in Romania, decided to start to publish in paper journals, because what I was trying to do was either disregarded as not counting, or discretely and “creatively” borrowed. I could not renounce to my believes, therefore I arrived to a system of waves of papers in arxiv, some of them sent to publication (so to say, the most conservative ones). After a time I started to recover after my strategic “fault”, but still there is work to do. But is it right to be forced to hide own beliefs? Apparently, I am right in my beliefs, which are similar to those publicly declared by great mathematicians, at least since 2004. Practically, a big chunk of my career was/is still disturbed by this immense inertia. I am surely just an example among many others colleagues who are suffering similar experiences. UPDATE (Jan 4 2013): See also this: Approximate groupoids again. I appreciated yesterday the talk of Harald Helfgott, here is the link to the arxiv paper which was the subject of his communication: On the diameter of permutation groups (with Á. Seress). where “stable configuration” means a set (or a family…) with some controlled behaviour of its growth under the “action of a group”, understood maybe in a lax, approximate sense. This applies to approximate groups, he said, where the action is by left translations, but it could apply to the conjugate action as well, and evenin more general settings, where one has a space where a group acts. My understanding of this bold claim is that Harald suggests that the approximate groups theory is a kind of geometry in the sense of Felix Klein: the (approximate, in this case) study of stable configuratiuons under the action of a group. Very glad about hearing this! Today I just remembered a comment that I have made last november on the blog of Tao, where I proposed to study “approximate groupoids”. Because a group acting on a set is just a particular type of groupoid, an action groupoid. Here is the comment (link), reproduced further. “Question (please erase if not appropriate): as a metric space is just a particular example of a normed groupoid, could you point me to papers where “approximate groupoids” are studied? For starters, something like an extension of your paper “Product set estimates for non-commutative groups”, along the lines in the introduction “one also consider partial sum sets …”, could be relevant, but I am unable to locate any. Following your proofs could be straightforward, but lengthy. Has this been done? (iii)- for any we have . UPDATE (28.10.2012): Apparently unaware about the classical proof of Ronald Brown, by way of groupoids, of the Van Kampen theorem on the fundamental group of a union of spaces, Terence Tao has a post about this subject. I wonder if he is after some applications of his results on approximate groups in the realm of groupoids. UPDATE 17.12.2012: Via the post of Sorin Ionita, here is the conclusion of the European Commision for Democracy through Law (Venice Commision) concerning the events from the Romanian summer 2012. Victor Ponta (aka My name is Paste. Copy Paste, according to The Economist), the Prime Minister of the Romanian Government, declared this morning that he has no intention to change the members of the Constitutional Court, or to limit their independence in any way..
Two hours later, the Government published in the “Monitorul Oficial” (the publication where laws appear, according to the Romanian constitution) a modification of the attributions of this Court. Because, you see, some days ago, the Government took under control the “Monitorul Oficial” institution. Before, this institution was under the control of the Parliament, closely monitored by the majority and opposition as well. 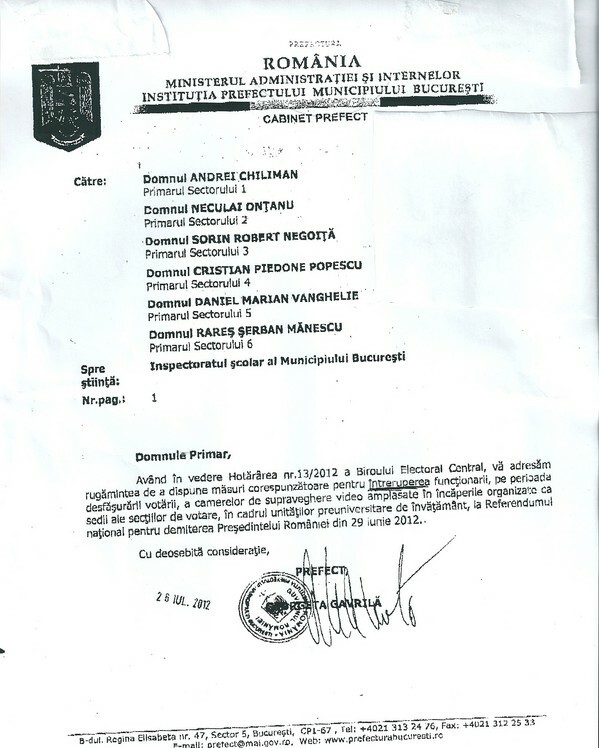 Any Romanian law or government decision becomes official only after the publication in the “Monitorul Oficial”, and only the form as published there is official. Now, the USL coalition submitted to the Parliament (controlled now by them) a demand to suspend the President of Romania. The Constitutional Court, which previously had the attribution to validate (or not) such demands, in the case of a majority in Parliament votes for this, now has only a consultative power (i.e. whatever the opinion of the Court is, nobody cares). PS. A picture from the public protest taking place in Piata Victoriei (where the government building is), Bucharest, taken from Hotnews.ro. 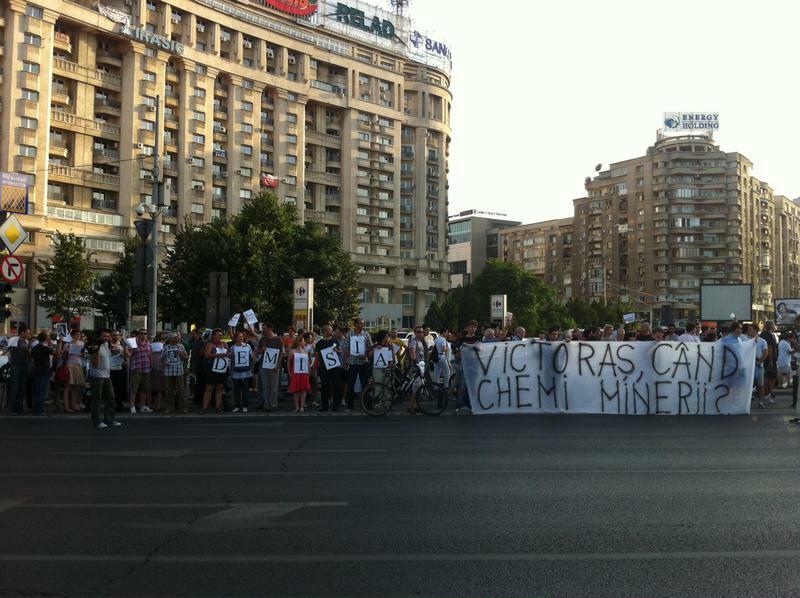 The banner says: “Victoras, when are you calling the miners?”. “Victoras” is a diminutive for Victor, the first name of the Prime Minister. The banner alludes to the 13-14 june 1990 events. The USL coalition, with Victor Ponta (acused of being a plagiarizer by Nature) and Crin Antonescu as leaders, dismissed the Romanian Ombudsman, then they took over the leading of the Parliament (from the PDL party, which no longer have the majority in the Parliament). There is a concerted attack against the Constitutional Court now, which is the last institution which can still block this coup. Here is a tweet by Viviane Reding, the European Commissioner for Justice, Fundamental Rights and Citizenship. The Romanian President made a public statement, here in Romanian, comparing what is happening now with the 1990s mineriad.